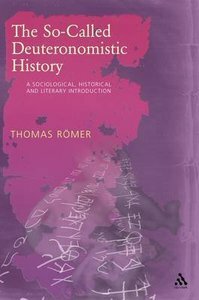 After a summary of research aiming at the present definition of "Deuteronomistic History", Thomas Romer provides a sociological, historical, and literary approach to the books from Deuteronomy to Kings. Romer examines questions such as: Why and how did Deuteronomism rise as a "school" under Assyrian hegemony? What role did propaganda play in the composition of these books? What happened on an ideological and sociological level during the Exile and Persian Period? Is the so-called Deuteronomistic literature properly understood as crisis literature? And what influence did the Deuteronomistic History have on the identity of the Second Temple period? - Publisher Thomas Romer begins by examining the content of the so-called 'Deuteromistic History' and then asks what the term really means. He then goes on to provide a sociological, historical and literary approach to the books from Deuteronomy to Kings. Romer examines questions such as: Why and how did Deuteronomism rise as a 'school' under Assyrian hegemony? What role did propaganda play in the composition of these books? What happened on an ideological and sociological level during the Exile and Persian Period? Is the so-called Deuteronomistic literature properly understood as crisis literature? And what influence did the Deuteronomistic History have on the identity of the Second Temple period. Thomas Romer begins by examining the content of the so-called 'Deuteromistic History' and then asks what the term really means. He then goes on to provide a sociological, historical and literary approach to the books from Deuteronomy to Kings. Romer examines questions such as: Why and how did Deuteronomism rise as a 'school' under Assyrian hegemony? What role did propaganda play in the composition of these books? What happened on an ideological and sociological level during the Exile and Persian Period? Is the so-called Deuteronomistic literature properly understood as crisis literature? And what influence did the Deuteronomistic History have on the identity of the Second Temple period. Thomas Romer is Professor of the Hebrew Bible at the College de France and Professor at the University of Lausanne. Introduction; Part I. The Content Of The So-called Deuteronomistic History (deuteronomy - 2 Kings); 1. Deuteronomy; 2. Joshua; 3. Judges; 4. Samuel-kings; Part Ii. What Does 'deuteronomistic History' Mean? - A Survey Of Past Research; 1. The Prehistory Of The Deuteronomistic History Hypothesis; 2. The Elaboration Of The Deuteronomistic History Hypothesis By M. Noth; 3. Major Modifications And Criticisms Of The Deuteronomistic History Hypothesis; 4. The Present State Of Discussion: A Time For Compromise? ; Part Iii. The Deuteronomistic History From The Assyrian To The Persian Period; 1. Who Were The 'deuteronomists'? ; 2. The Foundation Myth Of The Deuteronomistic School In 2 Kings 22-23: Book-finding And Cultic Reform; 3. The Three Different Viewpoints About Centralization In Deuteronomy 12 As An Example Of The Threefold Edition Of The Deuteronomistic History; Part Iv. Deuteronomistic Editing In The Assyrian Period And Royal Propaganda; 1. The Beginning Of Deuteronomistic Literary Production In The Seventh Century; 2. The First Edition Of Deuteronomy In The Assyrian Period; 3. Political And Military Propaganda In The Book Of Joshua; 4. Judges, Samuel And Kings; 5. Summary: The Origins Of The Deuteronomistic Library In The Neo-assyrian Period; Part V. The Constitution Of The Deuteronomistic History In The Neo-babylonian Period; 1. Setting The So-called 'exilic Period'; 2. The Structure And Ideology Of The Deuteronomistic History's Exilic Edition; 3. The Exilic Edition Of The Deuteronomistic History; 4. Summary: The Exilic Edition Of The Deuteronomistic History; Part Vi. Editing The Deuteronomistic History During The Persian Period; 1. Social And Political Context In Judah During The Persian Period; 2. The Main Themes Of The Persian Edition Of The Deuteronomistic History; 3. The Death Of The Deuteronomistic History And The Birth Of The Torah.